Guy Tal is writing an article for us in a couple of issues time but we thought it would be good to have a chat and record it as a podcast so you have something to listen to whilst you are out on location or just travelling to work. We recorded this using Skype which worked very well although but the different levels meant that my voice was quieter than I would have liked, please let me know if it is too quiet and I will try to fix using post processing. 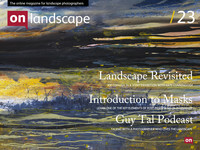 You can see some of Guy Tal's photography at http://guytal.com/.